bicycle, tuk tuk, inflatable horse…..anything really, If you want to ride it, wherever you want to do it, we are here to help. Do you want to ride the length of the country either really or virtally? Have you hidden away your inner desire to cycle in extreme conditions? We have an event or idea to suit most people. Contact our fundraising team to find out more and remember it is NOT just cycling. 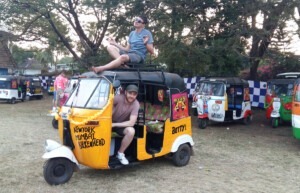 In 2016, to raise money for Autism Together, Tom Colwell and Rick Forster drove 3000 km up the west coast of India in an auto-rickshaw, or a tuk tuk. During their journey, Tom sent us this dispatch from Goa, where they had stopped for a rest day. Find out more about their fundraising adventure here.